DigiCrumbs: Dyson DC35 Digital Slim Multi Floor Cordless Vacuum Cleaner Only $229.99 - HOT One Day Deal! 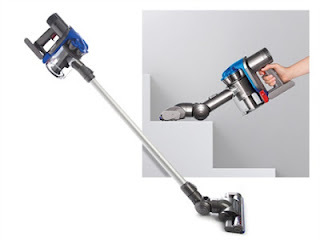 Dyson DC35 Digital Slim Multi Floor Cordless Vacuum Cleaner Only $229.99 - HOT One Day Deal! Update: It's Back!!! I ordered this woot deal when it was available in March and am loving my Dyson Slim vacuum. It's just what I needed to keep all my tile and hardwood floors super clean even with a toddler dropping food and tracking dirt everywhere. If you're interested in a Dyson vacuum, check out sellout.woot! and woot! where they are offering the digital slim and the dyson ball vacuums on deals today (5/9/12). Today, 3/29/12, home.woot! is offering a refurbished Dyson DC35 Digital Slim Multi Floor Cordless Vacuum Cleaner for only $229.99 + $5 Shipping. We just ordered one from home.woot! and are hoping this lightweight cordless vacuum will be perfect for quick cleanups after meal times, hard to clean stairs, and easier car vacuuming. As with all Woot deals, this deal is available until they run out for one day only (3/29/12). This is a great price as a new Dyson DC35 Multi-Floor Vacuum Cleaner is currently on sale for $329 at Amazon (where it has an average of 4 stars from 200+ reviews! ).